Chris went to the DFW Mud Run today. I got a lot of photos of Chris and his friend Joe who went along… and also, lots of gratuitous photos of hot guys. I found this item on Ebay a while back, and have been finding more and more of its information. This photo isn’t of the individual piece that I got (it’s from another site that had one on offer) but it’s identical. I’m looking forward to using this for counting the twists in tiny threads. These are quills of organzine that I’m sending to a friend of mine who makes lace. In each photo, they are in order from left to right: 2×2, 3×2, 4×2, and 3×3. That’s a bobbin full of four-strand tram. I can do the tram much faster, because it’s twisted about five times per inch, instead of 20. This is going to be a soft, shiny yarn for embroidery. It’s cool that you can see the difference in twist just from the sheen… the shiny one on top is the tram, five twists per inch; the one on the bottom is three-strand singles for organzine, at 20 twists per inch. That’s an ounce and a half of three-ply organzine singles… tightly twisted from three filaments, about 20 twists per inch. I’m curious to see what I end up with, length-wise; mathematically, it ought to be about three thousand yards. With the high speed wheel, it has only taken me a few evenings of twisting. and then you skein, and then degum… and then you get organzine! Here’s a comparison of the 4×2 and the 2×2… they’re not all that different, until you start working them up in larger amounts – and then the weight of the fabric shows. I’m making more organzine…. this time, for bobbin lace and sewing. If you set the caterpillars up on a surface where they can’t find a corner, they’ll make this stuff. It doesn’t hurt them, although it probably frustrates their instincts. 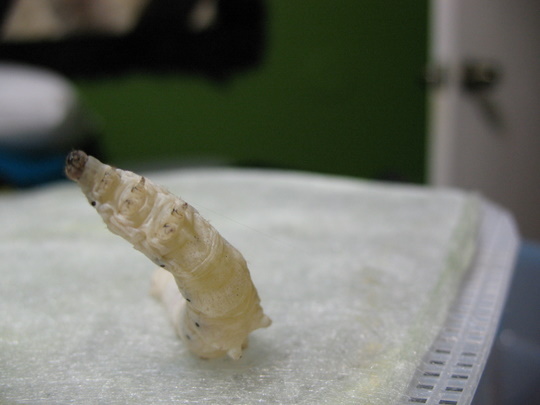 After spinning out their silk, they turn into a healthy pupa. 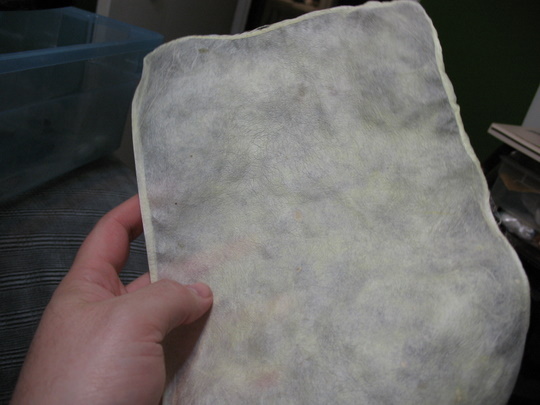 This is the surface of the paper. 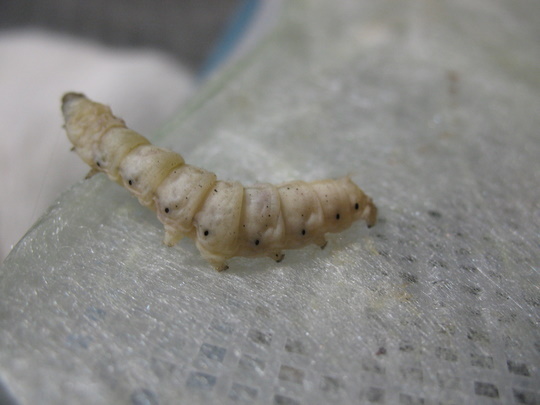 One of the things I learned from the first run – make sure the silkworms are DONE pooping, really, are you SURE you’re done, before you put them on the paper. You can’t wash it out once it’s sandwiched between layers of silk. This is how I set them up to spin the paper. There has to be an overhang, so that they cannot crawl down without crawling upside-down, which they avoid. 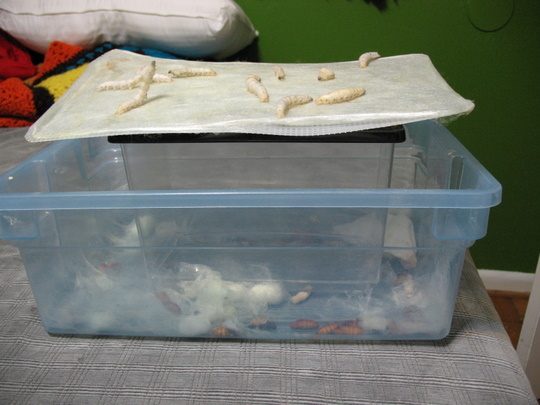 Once they are done spinning, they turn into pupae, often right on top of the paper; then, I put them down in the bottom. A few have managed to climb down there on their own. Here, you can still see the plastic needlepoint canvas through the silk. As they work on it more, the silk becomes more opaque, and you don’t see the canvas. This one looks like he’s dancing, or doing Tai Chi. Notice the little “hemmed” edge – the worms tend to pull the silk back from the edge of the canvas base and then silk over it more. It really does look like a turned hem. I washed and ironed the sheet, which made it shrink and wrinkle a little. 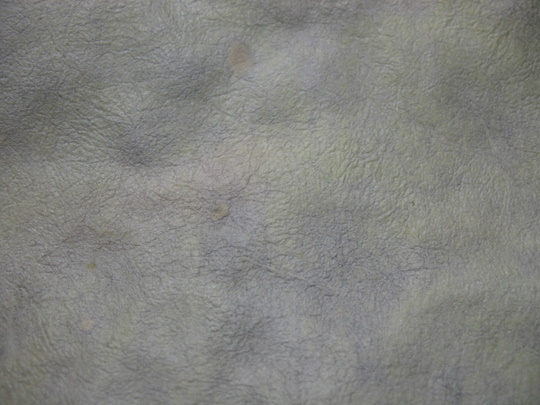 I think it looks like leather. 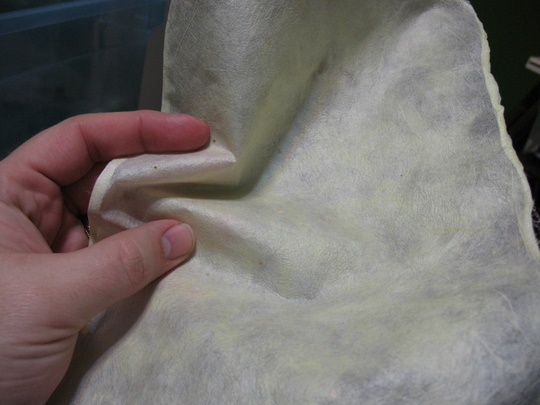 The finished sheet is about the stiffness of paper, although it does have a little bit of a more leathery drape. If you pinch it, the folds are sharp; it holds a crease well after ironing. I think it would be well-suited for certain origami applications. I know that some of the tribal women in Thailand use pieces of this stuff for applique on their skirts. There is a company called LiveSilk that is working on making a commercial product similar to this. I borrowed a friend’s Lendrum wheel (Thanks, Christina!) and did some throwing. The Lendrum’s high-speed head allowed me to get good fine twist, something that had been a problem previously. All told, this is just over 400 yards of 40d4×2 organzine.